Hundreds of people turned out in Morpeth on Saturday (November 14th) to help celebrate the big switch on of the Sanderson Arcade Christmas lights. The event was hosted by Heart Radio presenters Justin and Kelly and sponsored by Stratstone Tyneside BMW who handed out two thousand free Santa hats throughout the day – turning the town into a sea of Santa’s. The company’s new X1 also featured a special Santa’s Grotto for young shoppers to meet Father Christmas and let him know what they would like for Christmas! In between games and activities from Heart Radio there was also a special performance from local choir Morpeth Chantry and Newminster Schools who got everyone in the packed piazza area in the festive mood with some beautiful carols. X-Factor’s Lola Saunders entertained the crowds before a special blessing of the Tree of Light took place by The Revered Gary Ridley, Minister from the Methodist Church in Morpeth and Dr Caroline Pryor, Deputy Lord Lieutenant of Northumberland. The blessing was organised by Rhona Dunn, President of the Morpeth Rotary Club and helped switched on by Mayor of Morpeth Alison Byard and Wansbeck MP Ian Lavery. 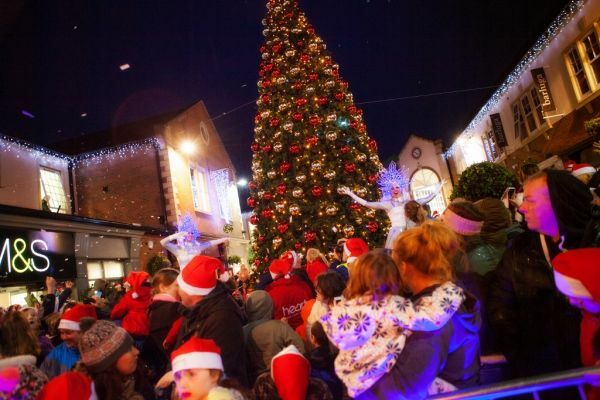 A representative from the Rotary Club will be near the ‘Tree of Light’ in the Piazza area daily from Noon until 2pm for those that would like to leave messages for lost loved ones. Santa, Lola Saunders, Dr Caroline Pryor and Rhona Dunn then switched the lights on at 5pm to a burst of confetti which filled the piazza area. The Crockett family – Stephen and Ashley and their children Eve and Gracie – had a great start to the festive season after winning the Christmas wish list competition, shoppers were asked to put their Arcade Christmas wish-list in Santa’s postbox and the Ashington family’s entry was picked out as the winner.